Yellow dock (Rumex crispus) going to seed in a yard on Milledge Avenue in Athens, GA.
As a perennial herb offering food and medicine, yellow dock is a plant to know, especially during hard times. Native American tribes have considered yellow dock a panacea and survival food. Yellow dock (Rumex crispus), also known as curly dock due to the wavy edges of its long, narrow leaves, is an introduced plant from Northern Africa, Europe and Asia. It’s currently found all over North and South America, and has become a staple in traditional American herbal medicine practices. 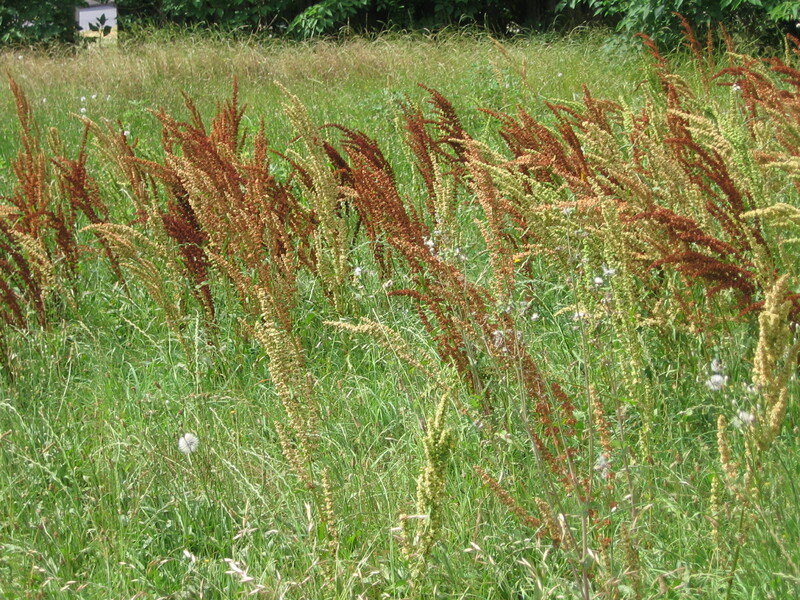 To recognize yellow dock from late spring and throughout summer, look for the tall seed stalks ranging from greenish-pink to dark rust as they dry along roadsides, in pastures, and wherever else the ground is compacted. As a member of the buckwheat family (Polygonaceae), the seeds can be ground and added to ground cornmeal for porridge, also known as mush, or it can be added to a base of ground maize and herbs to make pinole – a Mexican and Central American food or beverage, depending on the preparation. Yellow dock’s long, slightly-yellow taproot breaks up the hard clay soil, and is very difficult to remove from the ground. People who cultivate yellow dock for the commercial herbal trade have deep pits of loose soil so the taproot grows particularly long and straight, and is much easier to remove. A primary action for yellow dock root is to heal digestive complaints. Having both astringent tannins and laxative anthraquinone glycosides, specifically emodin and chrysophanin, yellow dock can dose-dependently act as an astringent for diarrhea, or as a gentle laxative, also known as an aperient. Smaller doses are used in loose stool patterns, while larger doses, containing a higher quantity of anthraquinones, are indicated in constipation. A specific indication for yellow dock is when someone has an elongated, deep-red tongue which narrows into a point. The tongue indicates constriction and heat in the bowels. Yellow dock can be taken in low doses over an extended time as a tonic herb for low-grade gut inflammation, particularly associated with gastrointestinal imbalances, sometimes called leaky gut. As a mildly bitter herb, it stimulates the actions of the liver, which gives yellow dock its other traditional use as an alterative – called a blood purifier by old timers and Native Americans – which is a cleansing agent for toxicity often manifesting as itchy skin, known as pruritis, or as eczema, psoriasis, acne or joint inflammation. A decoction of yellow dock root can be taken internally, made into a salve, or used as a wash. For athlete’s foot, yellow dock root decoction – the root is boiled for 20 minutes – is used as a foot soak. Yellow dock root is often provided with iron supplementation for women because it is thought to increase iron assimilation. Throughout Southern winters and into early spring, yellow dock leaves are an excellent sour-tasting wild green to add to salads, stews, or cooked like spinach. When eating them raw, the younger the leaf the better. The stems can be peeled and eaten raw or roasted. Yellow dock leaves do contain some oxalates, as does spinach, so if you’re prone to kidney stones, refrain from yellow dock leaves. Though a mild plant, yellow dock is contraindicated in pregnancy due to its laxative effect, and cautioned with young children, as in during lactation. This article originally appeared in Athens Banner-Herald on Sunday, June 5th, 2011. Dandelion, Taraxacum officinale, leaf and root can protect the liver from toxic chemicals. Everybody knows the ubiquitous, perennial dandelion, but not everybody appreciates dandelions if they take up residency in their yard. Becoming familiar with dandelion’s uses might lead someone to think twice before taking a dandelion’s life. In the most jovial of uses, dandelion flowers are a favorite childhood material for necklace making, and the geometric seed-globes provide an endless source for blowing wishes. Used as food and medicine for thousands of years, dandelions are a standby for herbalists and wild food foragers. Originally native to Eurasia, common dandelion (Taraxacum officinale) was introduced to North America in the mid-17th century. 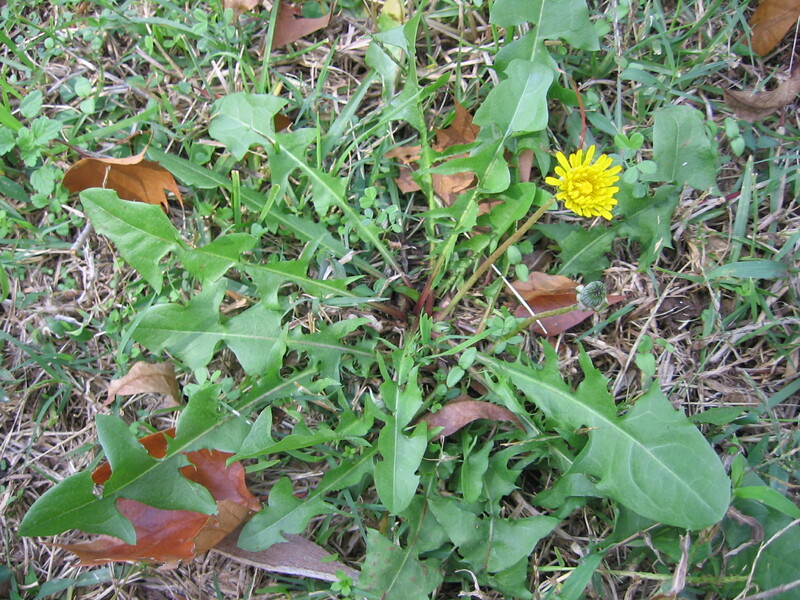 Due to dandelion’s skill in self-propagation, its introduction to the New World was likely an intention of the human and of the plant. Medicinal actions of dandelion could be summed up as simply cleansing. The leaf and root are considered an alterative, meaning they cleanse the blood of waste debris produced by our immune system and metabolism. Back when doctors used plants for medicine, they utilized dandelion for treating cases of “autointoxication,” a self-poisoning condition resulting from sedentary lifestyles, and diets of refined flour and high saturated fat. Recent research demonstrates dandelion leaf and root protect the liver from heavy toxins, such as carbon tetrachloride, also known as Freon. My auto mechanic explained how he digs dandelion roots from his yard to brew, which he learned from his grandmother. As an auto mechanic, exposed to toxins, his dandelion brew is great for his liver. Dandelion’s saw-toothed leaves are diuretic and high in potassium salts, supporting kidney health. The vitamin-rich leaf is higher in vitamin A than carrots, and also contains vitamins B, C and D.
Spring greens are tasty in salads, tossed with dandelion flowers for a splash of color. From late summer into fall, leaves grow bitter, which fosters good digestion. Add bitter fall leaves to sweet vegetables like beets, parsnips and sweet potatoes to balance the flavor. Dandelion roots stimulate the release of bile from the gallbladder, which helps to prevent gallstone formation, and has historically been used to treat existing gallstones. The taproot also is a gentle liver tonic used in chronic hepatitis. Current research demonstrated dandelion root induces apoptosis, or cell death, in leukemia cell lines. Dandelion roots contain inulin, a nonstarch polysaccharide fiber technically called fructo-oligosaccharide, which prevents fluctuations in blood sugar levels, while also feeding the good flora bacteria in the gut. Good intestinal bacteria play a significant role in a healthy immune system. Fall is the best time for dandelion root digging due to the significantly higher inulin content. Fresh roots are best, and can either be boiled, also called decocted, or roasted and used as a coffee substitute or additive. An herbal colleague makes dandelion root ice cream, which is surprisingly delicious. After a cost-benefit analysis of herbicidal consequences versus dandelion’s virtues, hopefully one will concede that it’s better to round them up with trowels and spades, and eat them, rather than using chemicals. This article originally appeared in the Urban Forager Column of the Athens Banner-Herald, Sunday, November 21, 2010. Roasted Dandelion Coffee: Roast cleaned dandelion roots on a cookie sheet for 4 hours until the roots easily snap and the insides are brown. Use a coffee grinder to grind the roots. For interest, add cardamon before brewing the dandelion coffee. Euell Gibbons’ Dandelion Wine: “Gather 1 gallon of dandelion flowers on a dry day. Put these in a 2-gallon crock and pour 1 gallon of boiling water over them. Cover the jar and allow the flowers to steep for 3 days. Strain through a jelly cloth so you can squeeze all the liquid from the flowers. Put the liquid in a kettle, add 1 small ginger root, the thinly pared peels and the juice of 3 oranges and 1 lemon. Stir in 3 pounds of sugar and boil gently for 20 minutes. Return the liquid to the crock and allow it to cool until barely lukewarm. Spread 1/2 cake of yeast on a piece of toasted rye bread and float it on top. Cover the crock with a cloth and keep in a worm room for 6 days. Then strain off the wine into a gallon jug, corking it loosely with a wad of cotton. Keep in a dark place for 3 weeks, then carefully decant into a bottle and cap or cork tightly. Don’t touch it until Christmas or later” (pp. 81-82). Gibbons, E. (1962). Stalking the wild asparagus. 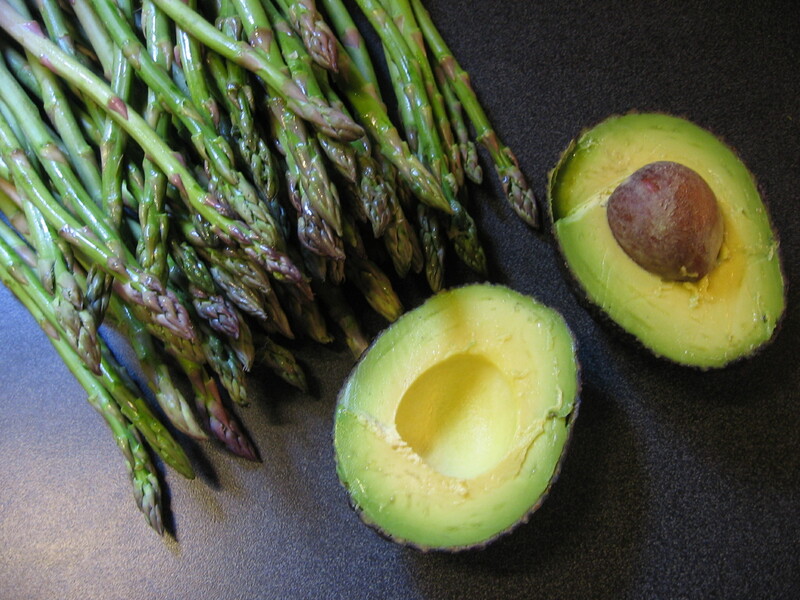 Chambersburg, PA: Alan C. Hood & Co.
Asparagus and avocado are the 2 highest foods in glutathione. We may not deliberately poison ourselves, but we are exposed to poisonous toxins in our air, water, food and drinks, and clothing. Our body works hard to keep toxins from entering into our tissues and cells. The #1 most important antioxidant for free radical protection is also mega important for detoxification: glutathione. We make glutathione in the body (it’s called glutathione conjugation), and we can also find it in our food. Glutathione prevents accelerated aging and many diseases associated with toxins and the degeneration of the body: cancer, liver disease, dementia, mood disorders, cataracts, etc. Many lifestyle factors and diseases use large amounts of glutathione, thus causing a deficiency, which leads to liver dysfunction and disease. Heavy alcohol consumption, cigarette smoking, exposure to organophosphates (food pesticides) and other environmental chemicals all use existing body levels of glutathione. We need to actively replenish our glutathione levels. Asparagus is the highest tested food of glutathione. The second highest is avocado, and the third is purslane (Continue reading about wonder-food purslane in the previous post). An important note about avocado: not only does it contain glutathione, but it also contains GOOD fats. An avocado-enriched diet will lower bad LDL cholesterol more than a diet high in complex carbohydrates, according to clinical trials. In addition to the three powerfoods listed above, a diet rich in fresh fruits and vegetables, cooked fish, and grass-fed meat will also contribute to your glutathione reserve. Glutathione is easily absorbed from digested food, so work these into your menu plan as often as you can. Other ways of increasing glutathione are by eating foods and herbs that enable the synthesis or conjugation of glutathione to occur. Silymarin, a constituent from milk thistle (Silybum marianum), increases the rate of glutathione conjugation. It also prevents damage to the liver through protection from free radicals and increasing the rate of liver tissue regeneration. 70-200mg three times a day is a reasonable dose. Foods in the Brassica family (cabbage, broccoli, brussels sprouts) and limonene-containing foods (dill weed oil, caraway oil, and citrus peel) all help with glutathione conjugation, as well. Be kind to your liver. It is the source of longevity and vision (both literal eyesight and metaphorical insight, dreams, and creative life plans). Your liver is under considerable stress everyday. If you give it a hand, you will reap the benefits of a long and healthy life.